We completed a study into an emerging model of contact center technology – the all-in-one model — in which one vendor provides all needed solutions on a single platform. We surveyed the people and explored the processes that are keys to the acquisition and implementation of technology in today’s contact centers. 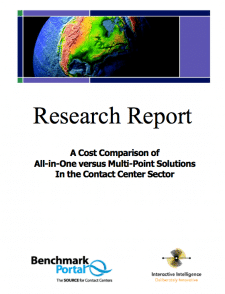 In particular we sought to understand base-line decisions made regarding a “multiple point solution” approach as opposed to the “all-in-one” contact center suite approach.